Can't wait to wear every single one of them! P.S. Can you guys believe it's November already?! It's crazy how time flies by! it's hard to believe summer was already so long ago! You are so lucky to have found this babies in your grandma's house :x I loooooove the first one and the blue sweater ! Your are a lucky girl, I love the orange one. Kisses. HA! I need to go through my grandmas things! Great idea! Grandma's vintage is the best kind of vintage, so much more meaningful. I wish I lived near my grandma to go through her clothes! nothing beats snagging cool finds from your mother or grandmother.... stylish and they have sentimental value. great stuff :) we really like the blog! What great finds! and they are even more special since they were your grandmother's! I have several pieces from my grandma and I'm always excited to wear them just because they were hers. I know, I was just thinking the same thing about it being November already. I am shocked! 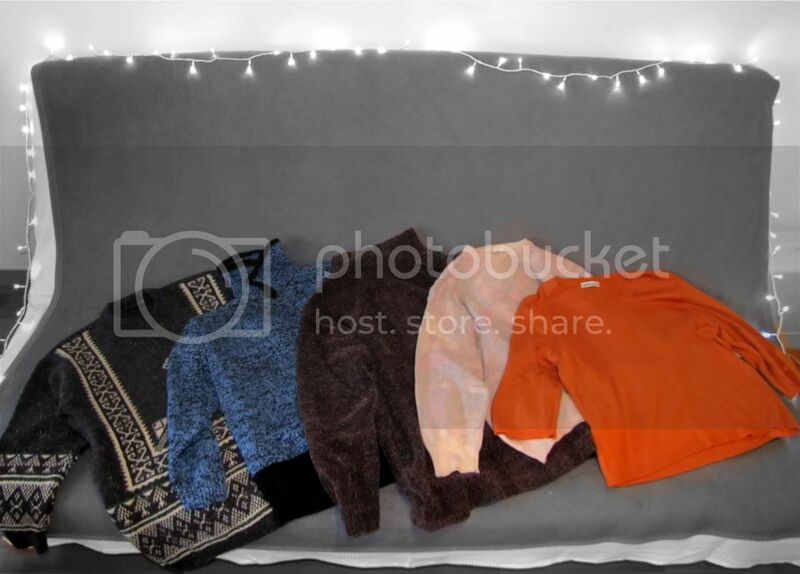 Cute sweaters. Your grandma has great taste. Thanks for your comment on my blog. How good is wearing vintage pieces with a personal history!love using my grandma things!Love the grey one. Love the blue sweater and the orange shirt!